I must have that precious ring! Life is good. Your character managed to explore all the local ruins, clear out some monsters, and secure some sizeable treasures. You consider tracking down some rumours about a powerful fighter's ring, but before you can follow upon them, the meadows and glens around town begin to mysteriously transform into swamps and dark forests. Terrible creatures make lairs around the town and frighten its people. Finally, a worthy quest to test your mettle! You set out to locate the evil that has caused this and save the day. But, from the other side of the screen, your referee thinks to himself, "All he has to do is get by ogre guards, hill giants, and a covey of green hags, and find a magical ring he doesn't even know exists. This should prove entertaining." Can one ring change a world? 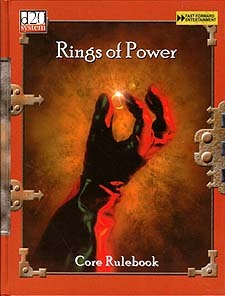 This 160-page core rulebook is filled with the kind of epic magical rings that whole campaigns are drawn around. Amaze your characters by giving them the Odin Ring of Riches, but just for 365 days. Give them the challenge of seeking the Death God's Circlet; all they have to do is give up their souls for a while to get to the plane of death. Let your powerful characters challenge Drawmij himself for his wizard ring. Will he give it up without a fight? Not bloody likely! * 78 enchanted rings, circlets, and bands, all fully detailed using the d20 System, with brilliant background information to drop them into any fantasy campaign. * Each ring is presented in two sections. The first section is an imaginative story packed with details to give the referee the ring's turbulent history and present situation. The second section provides complete d20 System details on the ring and any guardians or wards protecting its present location. * Precise game information details how a magical ring is forged, including repair, difficulty, and elements necessary for creation. Requires the Dungeons & Dragons Player's Handbook, Third Edition.